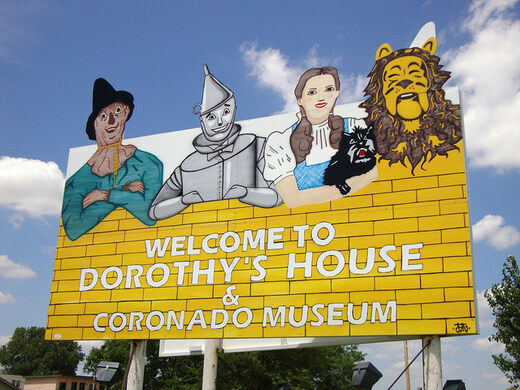 The Dorothy’s House museum and Land of Oz is a trip over the rainbow into a land populated with dusty mannequins dressed in ill-fitting costumes. Lone survivor from Custer's Last Stand forever preserved. Tribute to the famous Notre Dame football coach who died in a plane crash. Prior to the 1970s, the iconic Dorothy Gale made famous in The Wizard of Oz was simply from “Kansas,” no town given. With no actual town named, it was just a matter of time before some enterprising Kansas-ians jumped on the opportunity to claim the title, and Liberal, Kansas was that town. The story goes that Max Zimmerman, an insurance agent from Liberal, Kansas attended a convention in 1978. Max entered the convention wearing his name tag and when a waiter noted his state of origin he said “Oh, you’re from Kansas. That’s where Dorothy’s from.” Max asked the waiter, “What would you expect to see in Kansas?” The waiter replied, “Dorothy’s house, of course!” leading the businessman to ponder – just where in Kansas was Dorothy’s home town? He quickly learned that no other city had claimed the title, and the lightbulb in his head blinked into action. Why not Liberal? An equally intrigued resident of Liberal offered to donate a house built in 1907 much like the famous house described in the story, and the rest is entrepreneurial history. In 1981 the city moved the house to the grounds of the Seward County Coronado Museum. The house was transformed into a replica of the house shown in the movie, and recognized by then-governor John Carlin as the official home of Dorothy Gale. Today visitors can tour the house and grounds as well as a 5,000-square-foot exhibit and animated journey through the movie. 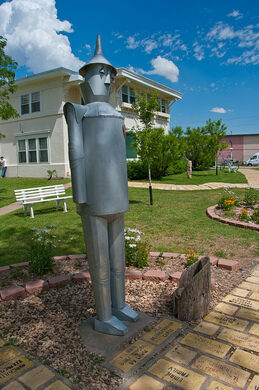 While waiting for your adventure through the Land of Oz, there is often opportunity to poke around the Coronado Museum as well. Don Francisco Vasquez de Coronado and his band of 36 soldiers were the first Europeans to visit what is now southwest Kansas. They traveled through in 1541, looking for the fabled “Seven Cities of Gold,” leaving behind them a legend and a few small items such as a Spanish spur which has been authenticated as belonging to his party. The museum also has an extensive collection of weapons and mysterious medical devices. After you tour the museum a docent will call your name and your journey through Oz can begin, led by docents that are usually local girls dressed as Dorothy. The tour begins in the replica Dorothy’s house where your Dorothy-esque docent will show off interesting items such as the family chamber pot and Aunt Em’s “hair jar.” She then invites guests to skip down the Yellow Brick Road with her to Oz while mentioning that, for a meager donation, your name can be on a brick along with previous visitors Ronald and Nancy Reagan. At the end of the yellow brick road stands a warehouse, but when the doors are opened the road continues, painted on cement, with displays honoring every character and plot in the film. “Dorothy” points out key items and describes the movie scene by scene, all while engaging the guests including the adults. “Animatronic” is a generous description of the animation that occurs in the scenes; it’s better described as fans blowing and turntables spinning, “environmental effects.” The Emerald City and wizard’s chambers are created from a futuristic collection of green tanks and a plywood archway, the wizard’s face projected onto a head-shaped screen. Some of the projections, lights and sound effects recall the psychedelic era – but that’s what makes it so fun. At the end of the tour “Dorothy” shows off some of the memorabilia left behind by former cast members. She also shows off a model house and proudly proclaims it to be the actual house used in the tornado scene, and with that, your walk down the yellow brick road is complete. This Wild West attraction is probably more fiction than history, but that doesn't mean it's not awesome. On a college campus in the Oklahoma panhandle a museum honors the last piece of the contiguous United States to be classified as No Man's Land. At Oklahoma Panhandle State University, a plaque marks a place once known as No Man's Land in the linear world and the fictional Kcymaerxthaere as well.